Located a few miles north of Swaffham, Castle Acre is one of the best preserved Norman towns in the country (though today 'village' would be closer to the mark). The castle itself comprises a large motte and bailey - both earthworks still eminently recognisable - with the foundations of a keep overlooking the site, river valley and piggeries beyond. The village maintains its medieval street pattern, and through traffic has to negotiate a stone Bailey Gate (width restriction 6 foot 6) to reach the High Street. 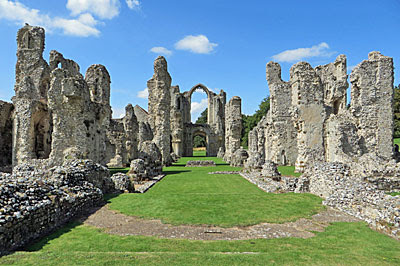 To complete the historic triumvirate the remains of a Cluniac priory lie in meadows to the west of the village, remarkably intact given that Henry VIII had the place pulled down, now run by English Heritage for visitors to pore over and explore. Castle Acre is densely-packed heritage par excellence, but how the residents cope with the influx of erudite tourists I'm not sure. Formerly the Ecotech Centre, this sustainable attraction lies off the Swaffham bypass at the back of a commercial estate. Conceived as a millennial project, its worthy credentials were in the right place but lacked a certain oomph to make the project a success. Now sponsored by a green electricity company, the centre makes more money out of conferences and school parties than casual visitors, but still attempts to spread the eco-message to anyone who stumbles by. 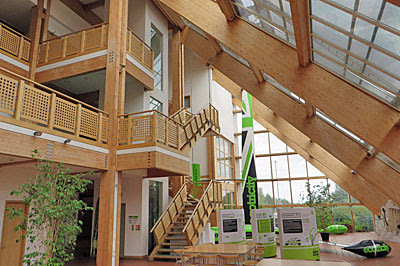 Exhibits include the world's fastest wind powered vehicle, and the structure itself, the largest timber framed building in the UK. But what should really draw in the punters is the 220 foot wind turbine at the foot of centre's large garden, and the opportunity to climb 300 steps to the top. At the top is a unique observation deck designed by Sir Norman Foster, where you can look out across Norfolk through the swishing blades, so long as you arrive in time for a scheduled tour. Open weekdays and summer weekends only. On a patch of grass behind the control tower at Norwich Airport, the city's aviation museum lays out its aeronautical wares. The most impressive of these are the old aircraft lined up on the lawn, mostly jets, ranging from a quite small Cessna to a massive Nimrod. 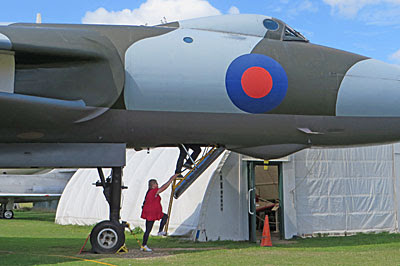 Pay a token extra and you can go on a tour inside the latter, ditto the opportunity to climb into an actual Vulcan bomber and stomp around the actual cockpit, which is rather special. Elsewhere on this somewhat compact site the story of Norfolk's aviation history is told, which of course means an awful lot about Second World War British and American airfields, but also touches on the fate of the commercial airlines Air Anglia and Air UK which used to fly from the terminal across the fence. An inexpensive half-day out, ideal for excitable grandfathers and their progeny. The town at the heart of the Norfolk Broads is a heady mix of messing around in boats and shopping. The River Bure ripples with pleasurecraft either owned for years or hired for the day, trying hard not to bump into each other or the swans on the water. 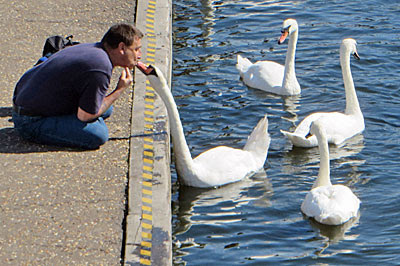 I was particularly unnerved by one man who'd turned up on the quayside specifically to communicate with the swans, hiding small chunks of bread in his mouth in an attempt to get the birds to appear to snog him. Most other holidaymakers were here for the fish and chips, or for the chance to spend money at the legendary Roy's of Wroxham, a department store spread out across several buildings in the heart of town. The store has the common touch, and reels in punters seeking cheap gifts, clothing, toys and other bargains, because there's only so much water you can stare at on an East Anglian day out.